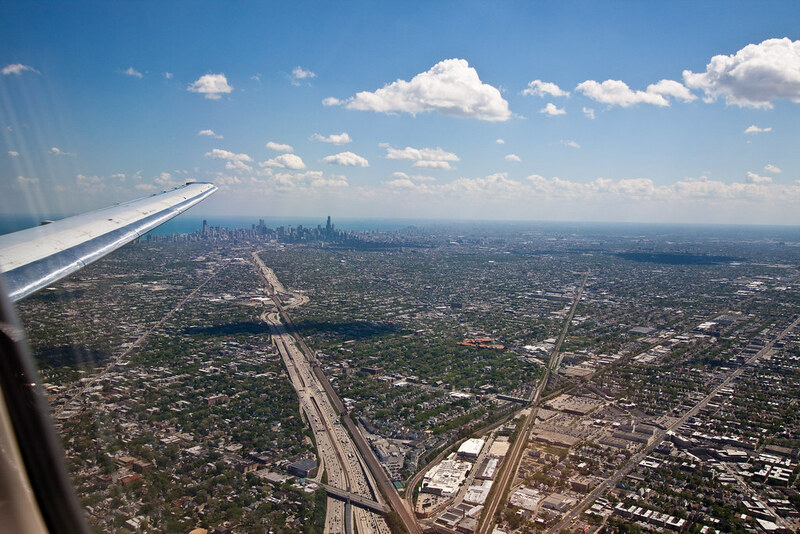 Most of my family still lives in the Chicago area so we make a yearly trek to IL. As part of this year’s trip I took some of my family on an overnight visit to downtown Chicago. Life has kept me from being able to spend much time on photography but I had hopes of doing some “serious” photography in the city this year. I figured that being on vacation would allow some time for pics but the highest priority was spending time with the kids and that’s what I mostly did. I did manage some shots but really couldn’t spend time composing or trying different vantage points. That said, I snuck out of the hotel room at sunrise and headed toward Michigan Avenue. 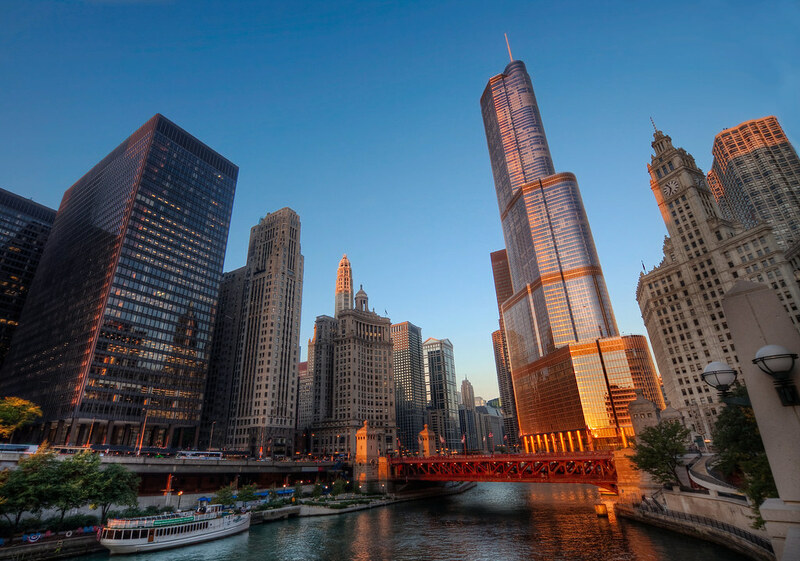 I caught a glimpse of the orange light of the early morning sun on the Trump Tower from a block away so I picked up the pace and walked to the Chicago River a block east of Michigan Ave. In order to get the composition I wanted I had to set up the camera on one of the pillars of the stone wall above the river. I was a bit nervous about that but just moved with caution to avoid knocking everything over the wall. There are several things I like about this shot. The orange glow of the Trump Tower was just right. I liked how the wide-angle lens makes the buildings on either side of the river lean as if they’re getting ready for a cross-river showdown. Finally, I’m partial to Chicago and therefore just think any downtown shot in the city looks cool. I hope you like it too. As for processing, this shot started life as a 4-exposure HDR (-4, -2, 0, +2). Three exposures were nearly sufficient but I needed the -4 exposure to tame the reflective highlights at the bottom of the Trump Tower. I brought the tonemapped image into Photoshop with the four original exposures and masked pieces of each into the image. I use Noiseware to clean up the sky. Finally, some sharpening and curves adjustments and I was pretty much done. I had intended to play around with Topaz Adjust to see what I came up with but I never got around to that…maybe I’ll have some fun with that in the future. 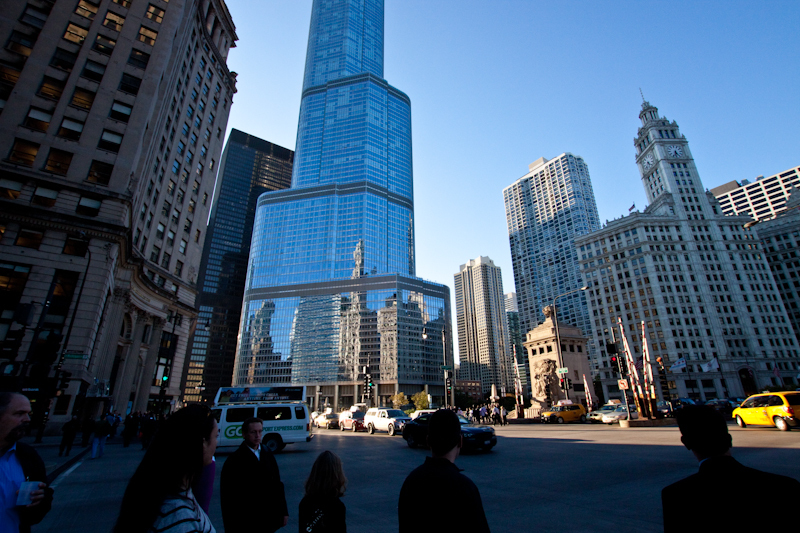 Here’s a daytime shot of the Trump Tower. As you can see, there’s no orange in that building at all — the morning sun was simply *that* orange.